This week’s Newsweek magazine cover features an image of a chimpanzee behind the words, “A Back Door for Ebola: Smuggled Bushmeat Could Spark a U.S. Epidemic.” This cover story is problematic for a number of reasons, starting with the fact that there is virtually no chance that “bushmeat” smuggling could bring Ebola to America. (The term is a catchall for non-domesticated animals consumed as a protein source; anyone who hunts deer and then consumes their catch as venison in the United States is eating bushmeat without calling it that.) While eating bushmeat is fairly common in the Ebola zone, the vast majority of those who do consume it are not eating chimpanzees. Moreover, the current Ebola outbreak likely had nothing to do with bushmeat consumption. An American prepares a deer he killed. Photo by John Beagle, shared with Creative Commons license. Far from presenting a legitimate public health concern, the authors of the piece and the editorial decision to use chimpanzee imagery on the cover have placed Newsweek squarely in the center of a long and ugly tradition of treating Africans as savage animals and the African continent as a dirty, diseased place to be feared. What can social science tell us about why Newsweek’s cover story is so problematic? The Europeans who colonized Africa in the late 19th century were members of a culture obsessed with classifying and categorizing the natural world. This quest built much of modern biology (think Darwin and his beetle collection), but it also led to some rather unscientific justifications for the colonial project. One of these was an idea developed by Frederick Coombs, author of Coombs’s Popular Phrenology. In the book, Coombs expounded a then-popular (and completely wrong) idea that the size, shape and other physical characteristics of a person’s skull determine that individual’s intelligence. Coombs and his fellow phrenologists started with the assumption that non-northern and western Europeans — namely, southern Europeans (who were not considered to be racially “white” at the time) and people of color — were inherently less intelligent than northern Europeans with light-colored skin. Not surprisingly, this flawed premise led these Victorian gentlemen to reach a flawed conclusion: that people with heads that were supposedly more “ape-like” in shape were less intelligent than northern Europeans and therefore in need of the “civilizing mission” that colonization was supposed to bring. The Victorian phrenologists developed elaborate typologies supposedly showing that Africans had the most apelike — and therefore most “savage” — skull types, thus justifying their subjugation under colonial rule. While Coombs’s book may be the best-known of the works of Victorian phrenology, the racism that his conjectures embodied was deeply embedded in the culture of most colonizing states. Most Westerners of the time believed that people of color were “savages,” desperately in need of the benefits of modernity, Christianity and intelligence the colonists believed they were well-suited to bring to Africa. As societal norms tend to do, the racism embodied in the notion that African people’s skulls are more similar to those of other primates than those of other homo sapiens skulls made its way into popular culture. 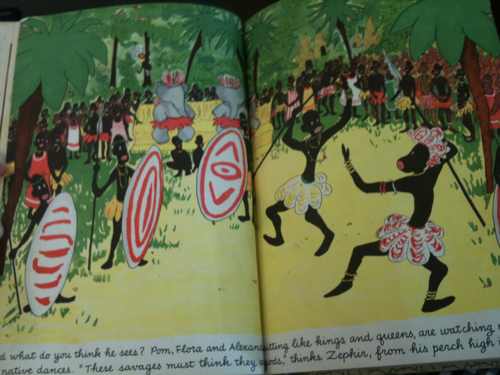 And it did so in a particularly insidious way: by portraying Africans as apelike savages. Images showing Africans as apelike were commonplace. In popular culture, Africans were portrayed in postcards, film and literature as “savages” who were not as “civilized” as their colonizers. These stereotypes even extended to children’s books. A Belgian cartoon book, Tintin au Congo, is perhaps the most famous of these representations; there, the Congolese people whom boy adventurer Tintin encounters are at times almost indistinguishable from the great apes of central Africa. Africans with exaggerated lips and other features who maintain extended-limb, apelike postures are portrayed throughout the Babar series. As historian Sarah Steinbock-Pratt notes, imagery of Africans as hyper-sexualized savages — cannibals, even — persisted in cinematic representations of Africa throughout the 20th century. This long history of white people associating Africans with primates — both savage, running wild in the jungle (never mind that most Africans live nowhere near a jungle or any of the great apes) and threatening any white people who approach — has not evolved as much as we might hope in the last century. Coombs, the Victorians and the people who created appalling 20th century popular culture relating to Africa were engaging in a practice scholars call “othering.” Othering happens when an in-group (in this case, white northern Europeans) treat other groups of people (the out-group, here, Africans and other people of color) as though there is something wrong with them by identifying perceived “flaws” in the out-group’s appearance, practice or norms. Othering has real consequences; for example, international media othering of Somalia in the early 1990s led to the misidentification and oversimplification of the conflict’s dynamics by global policy actors. Rather than understanding the complex nature of Somali society, the violence there was portrayed as clan warfare involving savage peoples who had hated one another since time immemorial. This misrepresentation led to two decades of misguided and ineffective policy responses to the Somalia crisis. Newsweek’s use of a chimpanzee to represent a scientifically invalid story about an African disease is a classic case of othering. It suggests that African immigrants are to be feared, and that apes — and African immigrants who eat them — could bring a deadly disease to the pristine shores of the United States of America. …there is an additional risk — all but ignored by the popular press and public—lurking in the cargo hold [of trans-Atlantic flights] below: bushmeat contaminated with the virus and smuggled into the U.S. in luggage. The reason this “risk” is ignored is because it is infinitesimally close to zero. By tracing back the initial human-human transmission events, we were able to show that, in May, the putative first human victim bought freshly killed bats from hunters to eat. We were able to reconstruct the likely initial human-human transmission events that preceded the outbreak. This study provides the most likely sequence of events linking a human Ebola outbreak to exposure to fruit bats, a putative virus reservoir. How threatening is illegal fruit bat importation as a potential pathway for an Ebola outbreak in the United States? The study cited in the Newsweek story on illegally imported wildlife does not make any mention of fruit bats being smuggled into the country. There were also no fruit bats among specimens confiscated as part of a crackdown on (and study of) illegal importation of meats from African countries via Paris’s Charles de Gaulle Airport. The study’s authors also characterize Paris as being at “the extreme end of a spectrum” — meaning it would not be representative of other international cities to which people from African countries may travel. Ebola’s jump from its animal reservoir to humans is an incredibly rare event — even in those locations where the likely animal reservoirs are much more prevalent. Extrapolating the likelihood of an animal-to-human jump for Ebola in the United States — a context where there are likely no fruit bats for sale — is not only misleading, it’s irresponsible. Newsweek is not alone in scare-mongering about the Ebola outbreak. Newsweek is not even original in its approach — pointing the finger at African immigrants smuggling bushmeat — as British and Swedish newspapers have previously published similar stories. The Newsweek story could generate additional prejudice against African migrants, a population that already suffers from greater prejudice than other immigrant groups. In the psychology study referenced above, researchers found that simply manipulating the geographical origin of a hypothetical immigrant group – from Eastern Africa to Eastern Asia to Eastern Europe — yielded significant differences in attitudes in a study population toward the immigrant group. Fear-mongering narratives about Ebola circulating in the popular media can also have a serious effect on knowledge and attitudes about Ebola. Though there are no cases of person-to-person infection in the United States, a recent poll conducted by the Harvard School of Public Health reports 39 percent of Americans think there will be a large Ebola outbreak in the United States and more than a quarter of Americans are concerned that they or someone in their immediate family may get sick with Ebola in the next year. A similar poll conducted for Reason-Rupe had four in 10 Americans saying an Ebola outbreak in the United States was likely, and conservative Americans were more likely to say an outbreak was likely. These two national surveys show Americans are grossly overestimating their risk of infection. The irony of writing about the use of primate imagery as an “othering” technique in a blog that takes its name from a reference to monkeys does not escape us. We hope our readers will understand, however, that The Monkey Cage is named for a quote about American politicians and politics, and that its naming had nothing to do with Africa or an attempt to “other” anyone. We thank Adia Benton, Melissa Browning, Michelle Carey, Mohammad Hamze, Meredith Killough, Kennedy Opalo, Charles Thomas, and Ben Witt for their suggestions for and assistance with this post.